Matthew Vassar returned to Poughkeepsie in 1848 from his extensive European tour eager to dedicate himself and his fortune to philanthropic and civic-minded endeavors. Vassar presided over the Poughkeepsie Village Board of Trustees and headed a committee to select the site for a new public cemetery to replace the city's overcrowded church graveyards. 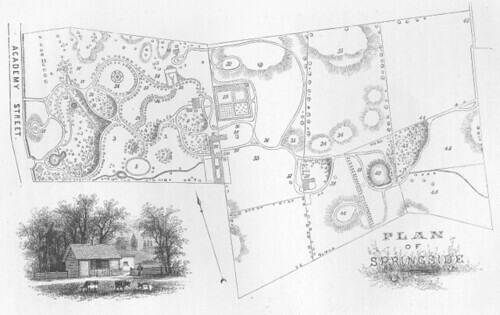 The committee settled on "Allen farm," a "suitable and attractive" forty-five acre undulating plot located along the village's southern boundary. In June Vassar himself purchased the property for $8,000 with the intention of selling portions of it to investors. Poughkeepsie citizens, however, met The Poughkeepsie Eagle's appeals for subscriptions with "unaccountable indifference." That fall Vassar commenced improvements suitable for both a cemetery and a private estate in case the cemetery venture did not materialize. Vassar hired Andrew Jackson Downing, a prominent architect and the most important American landscape gardener of the mid-nineteenth century, to plan for the land's development. Downing believed that the neo-classical tendency towards bold, symmetrical buildings that dominated a formalized, geometric landscape was inappropriate for the rugged New England and Hudson River Valley terrain. He popularized the Gothic Revival or Hudson River Bracketed style of architecture noted for its asymmetric outline, sloping gables, irregular windows and rustic finish that existed in "harmonious combination" with a more natural, unregulated landscape. Downing designed a network of paths and drives and a portal and porter's lodge for the south end of the property. 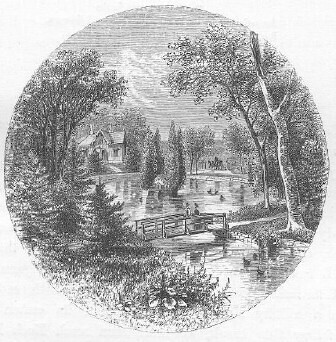 The cemetery committee eventually purchased another property on the bank of the Hudson River for use as a burial ground, and by the summer of 1851 Vassar was looking forward to turning the property into his own private estate that he would call Springside, for its numerous fountains and rivulets. 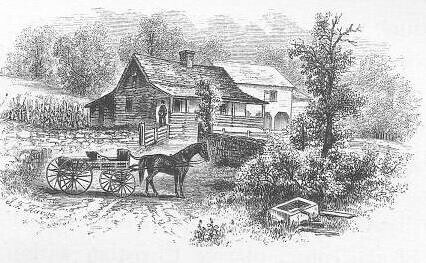 Soon the property included the porter's lodge, a cottage, barn, carriage house, ice-house and dairy-room, granary, aviary for wild and domestic fowls, and an apiary. Springside was to exemplify Downing's theories of combining the beautiful in nature and art. Trees embraced rustic board-and-batten style buildings, road and path networks accented the landscape's contours, and statuary and other embellishments united the buildings and the grounds. (1) The Poughkeepsie Eagle declared Springside "A Paradise" and wrote, "Thou art indeed the realization of a painter's dream, the embodiment of the poet's glowing thought. The hand of nature when guided by that of art forms a scene that cannot fail to please the most indifferent observer." And on June 12, 1852 the Eagle published "Ode to Springside," a poem, on its front page. Springside also embodied Downing's principles of variety, unity and harmony. In 1852 Professor Russell Comstock wrote of Springside: "We took a stroll over the ground of M. Vassar, Esq . . . and a more charming spot we never visited. There is combined within these precincts every variety of park-like pictorial landscape that is to be found in any part of our country – meadows, woodlands, water-courses, jets and fountains, elevated summits gently sloping into valleys, forming the natural openings for the roads to girdle the hills and knolls, and thence again reaching upward to the highest peaks, from whence the eye at one glance can survey almost every spot of the entire enclosure." Unfortunately, Downing would never see his project completed. He died on July 28, 1852 in a steamboat accident on the Hudson. After Downing's death, Matthew Vassar formalized the path arrangements, added a summer house, a greenhouse, a gardener's cottage, a pagoda, a small Stonehenge statuary along the Southern Avenue, and replaced the conservatory with a fountain. While Downing almost certainly intended at least the summer house, it is not clear if the other embellishments were part of his design. Vassar considered building the villa that Downing had designed for him, but decided to continue living in the caretaker's cottage. He especially enjoyed entertaining students and faculty members from the college at Springside, which remained open to the public until 1867 when Vassar retired there from his city home on Vassar Street. Vassar lived at Springside until his death on 23 June 1868. After Vassar's death, Secretary of State Judge Homer A. Nelson purchased the southern portion of Springside and named it Hudson Knolls. Judge Nelson did not reside there himself; instead Simpson House, an exclusive boarding facility, operated in a house overlooking Academy Street. Whitehouse bequeathed his business and his property to his son-in-law Eugene N. Howell. But Howell lacked his predecessor's enterprise, and in 1891 his shoe factory closed. Despite his misfortune, Howell's Springside continued to reflect wealth and privilege. Paths were always graveled and raked, lawns mowed and the large vegetable and flower garden well maintained. Howell also raised turkeys, chickens, pigs, and he built a golf course with a small club house. He commissioned the Philadelphia architect Horace Trumbauer to design an extensive suburban park settlement on his property, but this enterprise failed and he eventually sold the entire property. Both the northern and southern portions of Springside were again united under the ownership of William Nelson (no relation to Judge Nelson) who purchased both Judge Nelson's property in 1881 upon his death and the northern portion from Howell. Nelson, owner and operator of the Red Ball Line, a fleet of ships, lived in the former Simpson boarding house with his family. Nelson's wife Marie inherited the estate after his death and when she died, it went to her children. Although, in the 1950's, the Board of Education considered Springside as the site for a new high school, the property lay fallow until 1968, when the three Springside owners petitioned the Poughkeepsie Common Council to rezone the property for high-density residential and general commercial development. This ignited efforts to preserve the site, and in August 1969 the Department of the Interior, recognizing it as unique surviving example of the work of Andrew Jackson Downing, announced it eligible to be a National Historic Landmark. The designation, however, meant that only the Springside owners could apply to the National Park Service for recognition, something they were not likely to do given their commercial interests. Later that month, arson destroyed the carriage house and stables. Efforts to rezone Springside were not successful until 1970 when the developer Robert S. Ackerman purchased the property and successfully petitioned the Poughkeepsie Common Council to rezone Springside. The City of Poughkeepsie Planning Board subsequently approved his plan to build a large, luxury apartment complex. Ackerman vowed to preserve the gate house and summer cottage, the only remaining buildings on the site, but his plan revealed little consideration for the historic landscape. Springside sat dormant for several years, and in an attempt to spare the cottage from vandalism and the ravages of the environment, the state ordered the front dormer, front entrance, and most of the front façade dismantled and transported up the Hudson for display at the New York State Museum. When the edifice proved too tall to serve as a permanent display, staffers stored the remnants in a museum warehouse. Local preservationists were able to successfully halt development of the site in 1984 when Hudson River Sloop Clearwater, Inc., Hudson River Heritage, an environmental group, and a group of concerned citizens won a lawsuit against the City of Poughkeepsie Planning Board and Ackerman for failing to conduct an acceptable environmental impact statement. The Supreme Court, however, ruled against the preservationists. Fortunately, in 1984 Ackerman and the restoration group were able to reach an agreement stipulating that Ackerman would contain development to the former Nelson property and that a nonprofit organization would develop a plan, raise money and complete restoration of Springside. The organization, Springside Landscape Restoration, continues to dedicate itself to preserving Springside. For descriptions, photographs and maps of the property see Harvey K. Flad, "Matthew Vassar's Springside: '. . . the hand of Art when guided by Taste'" in Prophet with Honor: The Career of Andrew Jackson Downing, 1815-1852, (Washingtin D.C.: Dumbarton Oaks Research Library and Collection) Vassar College Special Collections; Robert M. Toole, "Springside: A.J. Downing's Only Extant Garden," Journal of Garden History 9 (1989), 20-39. Bensing Lossing, Vassar College and its Founder (New York: Alvord Printer, 1867), 59-62, 64-67. "Cemetery Meeting" Poughkeepsie Eagle, 1 June 1850. "Cemetery" Poughkeepsie Journal, 4 May 1851. A.J. Downing, The Theory and Practice of Landscape Gardening, (Little Compton: Theophrastus Publishers, 1875). Poughkeepsie Eagle, 5 August 1852, 7 Oct. 1852. "Ode to Springside," Poughkeepsie Eagle, 6 Dec 1852. Poughkeepsie Eagle, 12 June 1852. Robert M. Toole, "Springside: A.J. Downing's Only Extant Garden," Journal of Garden History 9 (1989), 20-39. Helen Myers, "Springside Site Developed by Vassar Had Many Famous Owners in Past Century," Poughkeepsie Sunday New Yorker, 21 Sept 1952, 192, 235, 260. Edmund Platt, "The Eagle's History of Poughkeepsie From the Earliest Settlements, 1683-1905 (Poughkeepsie: Platt& Platt, 1905), 205. "Mrs. Fitzpatrick, 70, Dies; Springside Tract Co-Owner," Poughkeepsie Journal, 2 March 1966. " 'Springside' Listed As Historic Site; Council Hears Rezoning Request," Poughkeepsie Journal, 22 Oct. 1968. "'Springside' Ruled Eligible to Be United States Landmark," Poughkeepsie Journal, 4 August 1969. "Arson Claims Buildings at Springside," Poughkeepsie Journal, 18 August 1969. "City Planners Recommend 'Springside' Rezoning," Poughkeepsie Journal, 29 October 1970. "New 'Springside' Plan Features Apartment, Historical Preservation", Poughkeepsie Journal, 21 October 1970. "Planners May Rescind Springside Project," Poughkeepsie Journal, 27 August 1973. P. Sleight, "Piece of City's Heritage Spirited Away to Albany," Poughkeepsie Journal, 28 Dec. 1976. T. Tapousis, "Group Works to End Years of Neglect at Springside," Poughkeepsie Journal, 17 July 1988. J.M. O'Neill, "State Preservation Group Grant Lays Groundwork for Historic Springside Estate Spruce-up," Poughkeepsie Journal, 28 Dec, 198. M. Eversley, "Group Planning to Restore Springside Estate," Poughkeepsie Journal, 24 Feb. 1990.